My mom this year decided to put up the Christmas tree in the front of the house, right in the formal living room in front of the window. That might not sound like a big deal, but, really, how many households actually use the formal living room that often? I told my mom this. Families spend most of their time in front of the television. Whether you consider this a tragedy or fact of life, it’s true, and I’m used to the tree being right there next to it, for everyone to see. I normally don’t like distractions while watching movies, but, during Christmas? I’ll make an exception to be able to watch Christmas movies while the tree is nearby. It just feels so… Christmassy. But, I guess, not this year. 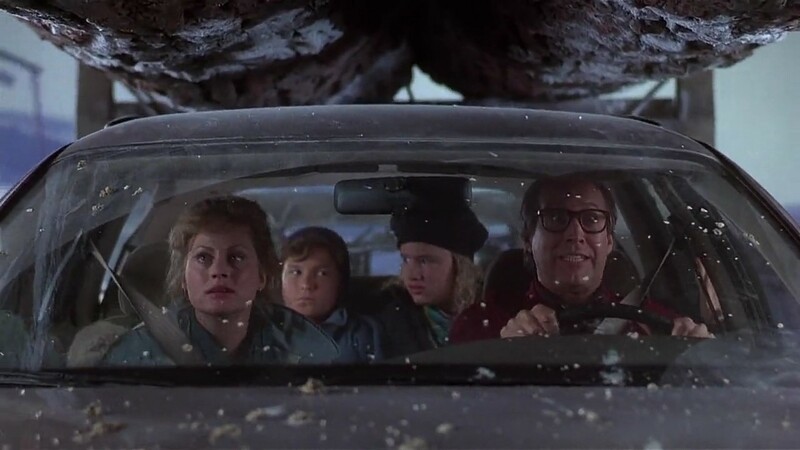 When I go home for Christmas this year, I’ll see the tree in the window as I pull up, but I’ll have to go out of my way to see the tree once I get inside. Lazy? Maybe, but it just feels weird. Why did my mom put it there and break our tradition? Her reasoning was that it’s nice to have the tree out at the front of the house where everyone can see, where we can pull up to the house and see the tree all lit up (and since it’s a fake tree this year, another break with tradition, it is, I guess, less of a safety hazard). In other words, she wanted to try having Christmas the “traditional” way, meaning the world’s typical perception of Christmas “tradition” and not our own. I don’t really know how to feel about this still, but I kind of see her reasoning, I guess. It’s unlikely we’ll have the house lit up with lights this year due to tight funding and time, and my mom loves decorating for Christmas, so I sympathize with her wanting something visually striking for the world outside to see, I really do. 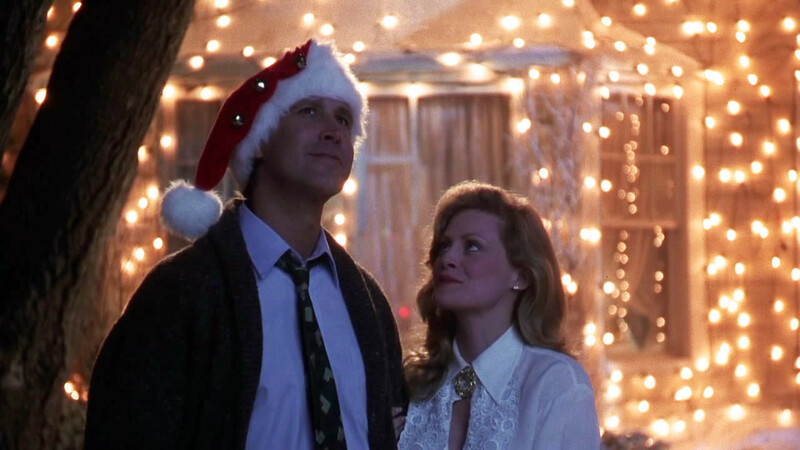 It all just reminds me too much of Clark Griswold, however, as he goes on a futile mission to lighting up his house and put on a spectacle for his family and neighbors in an attempt to recreate the greatest example of Christmas tradition since, as Clark later rather vulgarly puts it, “Bing Crosby tap danced with Danny [expletive] Kaye!” It might be the ideal Christmas tradition that everyone else pictures, but, just as it’s not normal for us to put our tree where we can’t see it regularly, it just wouldn’t be the Griswolds without several ridiculous mishaps. 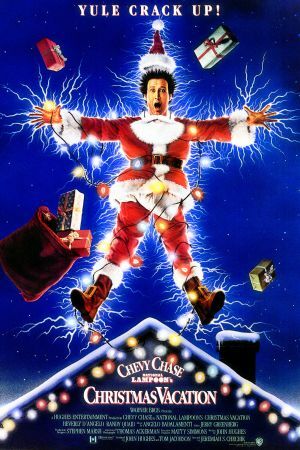 As the third film in a comedy series, you might expect Christmas Vacation to see the series wearing out its welcome. Honestly, I’d say that the entire Vacation series nearly came to that point with the rather dull second film, European Vacation, but, as they say, the third time’s the charm, and the Griswolds’ third outing has, honestly, proven to be my favorite of the bunch, thanks in large part to the very large and very excellent cast. As for the rest of the family, Juliette Lewis and Johnny Galecki fill in the roles of the perpetually changing Griswold kids this go around, making up for the boring and even annoying kids in European Vacation, and matching the first’s Dana Barron and Anthony Michael Hall in the “just your typical smart-mouthed kids” department. They’re different, of course, being far more sarcastic, but they’re believable and have good chemistry with everyone else. We also get to meet Clark and Ellen’s respective parents, and they’re pretty much as you would expect. Ellen’s parents (E.G. Marshall and Doris Roberts) are waspy lushes who never approve of their son-in-law, and Clark’s parents (John Randolph and Diane Ladd) are the traditional middle-American, reading-Night Before Christmas-around-the-fire-place type parents that Clark aspires to be. Yet he still can’t compete with the hilariously senile Aunt Bethany. 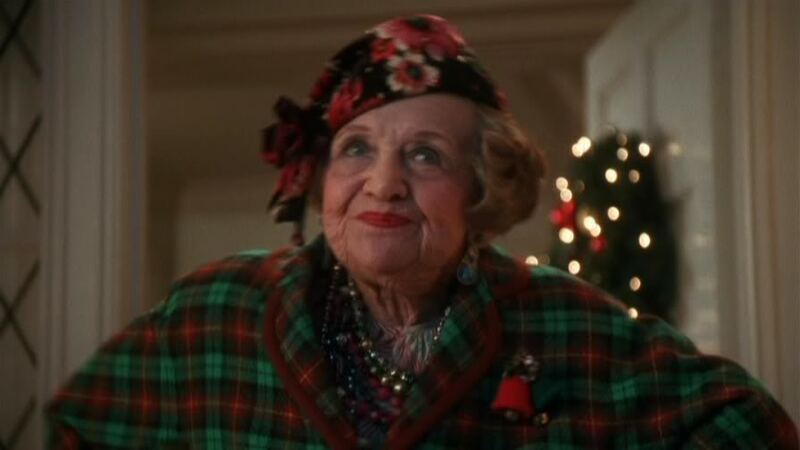 (“Oh, Aunt Bethany, you shouldn’t have!” “Oh dear. Did I break wind?”) Dressed like a plaid flapper girl and married to the crankiest old man next to Scrooge himself (William Hickey), Aunt Bethany is one of the sweetest, most hilarious old ladies put on film. The actual original voice of Betty Boop up until Who Framed Roger Rabbit, Questal makes the most of her limited screen time by providing the film some of its most hilarious moments, even when she’s just sitting there knitting, but by far the best is the Christmas Eve dinner where she provides the surprisingly patriotic prayer. 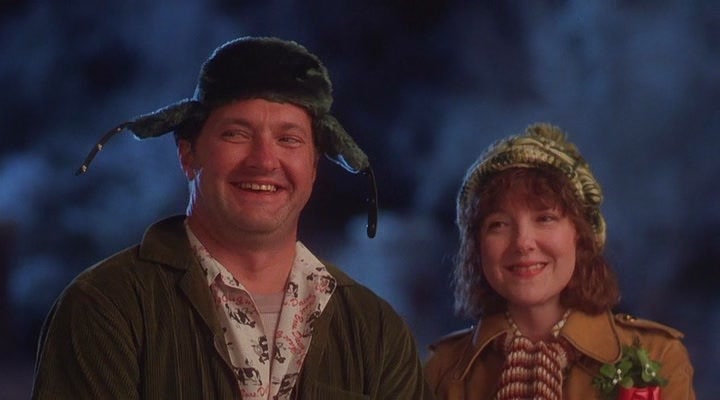 Christmas Vacation may not be the most cheerful or family-friendly film, but it’s sympathetic towards people like Clark and my mother, who aspire to make this Christmas better than the last for everyone, In the end, the film knows that, despite the squabbles between family members and troubles faced at work, what the traditional Christmas spirit is all about isn’t presents, food, or the perfect decorations. Those are all good things, and it’s fine to desire them, but what ultimately matters is family, love, peace, and goodwill towards all… including snot-dripping dogs. Yes….due to short funding and time….there will not be Christmas lights on the house. But when driving up to it outside, not only will you see the lit up tree but a door wreath with a lit up red bow! The inside of the house will be decorated to the hilt with everything matching and scented Christmas themed plug-ins and candles. Even the bathrooms will have decor and lights on the mirror! My favorite place is the kitchen and it’s the most decorated! The FAKE tree which isn’t a traditional real one but…..it has ornaments on it from when the kids were born up to the present and holds a lot of sentiment. Having the tree up front also allows us to have reason to use the front rom without the TV’s distractions. So yes, like Clark….I do try to stay as traditional as I can for family but do like to change things up a bit for excitment and curiousity. Glad you liked the movie since it itself is one of our traditional things to watch alongside my old musicals. Thank you for using me as an inspiration even though you mostly don’t like change. Se you wen you get home for Christmas! Nice review . 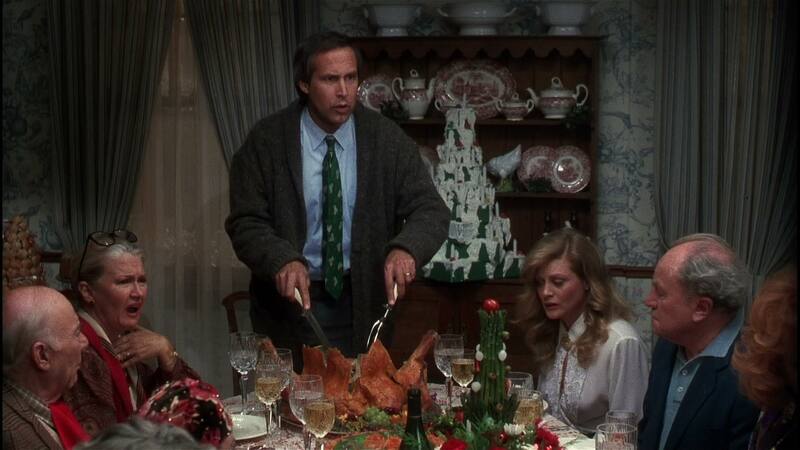 . . Christmas Vacation has become a staple in my families holidays. My parents have always jumped up to mute the Danny Kaye scene, so last year I ripped the movie and edited out every swear word for them. I don’t believe in editing movies, but this has been my only exception just because of how many people gather around it each year. Classic. Ha! I always remember my mom going “LALALALALA” over these scenes. Now I’ve openly quoted it in front of her. How times change. … Okay, maybe not the Danny Kaye one, but the other meltdown. … The one without the F-word. … I can’t say the F-word around her.